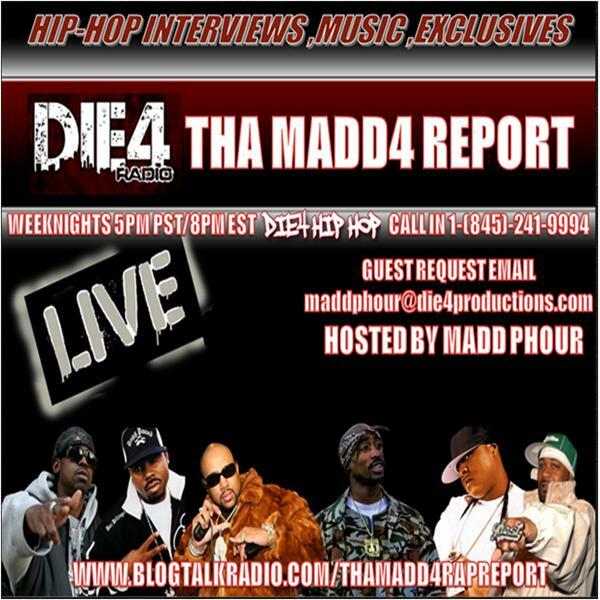 DIE4 RADIO/THA MADD4 REPORT IS A SHOW FOR HIP-HOP MUSIC AND ARTIST INTERVIEWS..STARTED IN OCT.2013 . WE HAD SOME OF THE BIG NAMES IN HIP-HOP JOIN US LIKE REDMAN/SMIF-N-WESSUN/RAS KASS/YUKMOUTH/MC REN/ M.O.P/CHUCK D/COLD 187UM/THE LUNIZ/CORMEGA/CPO/ BLACK MOON/BIG TWINS/MAC MALL/MC EIHT/TY NITTY/ BIG MIKE/K-DEE/GONZOE/JAYO FELONY/NATURE/G.O.D PT3/ALLFRUMTHA I/PETEY PABLO/LEE MAJORS/MJG/E3/ KEITH MURRAY/PMD/EA-SKI/GRAND DADDY I.U./BADAZZ/ POOH-MAN/KUZZO FLY/KOKANE/MAD MAXX/ALI VEGAS/ MIKE DELOREAN/B-LEGIT/RICHIE RICH/SIR JINX/DAZZIE DEE/ KTOE/FREDRO STARR/MC SHAN/KILLAH PRIEST/THE GATLIN/ FRUKWAN/BUSHWICK BILL & ALOT OF OTHERS....SO PLEASE ENJOY THE ESSENCE OF REAL HIP-HOP!!! Die4 Radio-Tha Madd4 Report...Special Guest "Tha Comet"
Die4 Radio "Season Ending Episode,2018 Review"
Tha Madd4 Report Presents "Hip-Hop Beef & Diss Records"
Die4 Radio-Tha Madd4 Report...Special Guest "Tha Chill"
Die4 Radio-Tha Madd4 Report...Special Guest "Tony A." Die4 Radio-Tha Madd4 Report...Special Guest "Ty Nitty"
Die4 Radio-Tha Madd4 Report...Special Guest "Jourdin"
Die4 Radio-Tha Madd4 Report...Special Guest "Blaq Poet"